The term “Skillet” was derived from a combination of Skids and Pallets. Skillets are essentially moving platforms pushed end to end along a track. Consider an analogy where you would push a series of boxes across the floor by pushing on the end box and moving the others. 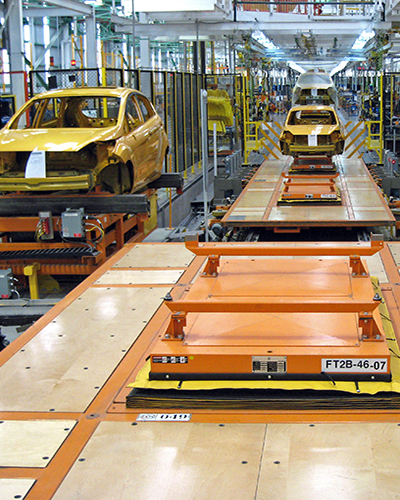 Universal access to the product and the feature that workers are moving on the same platform as the car body are positive ergonomic and efficiency features. Automatic Systems, Inc. takes the following three items into consideration for the design of the skillet system. Choose Narrow vs. 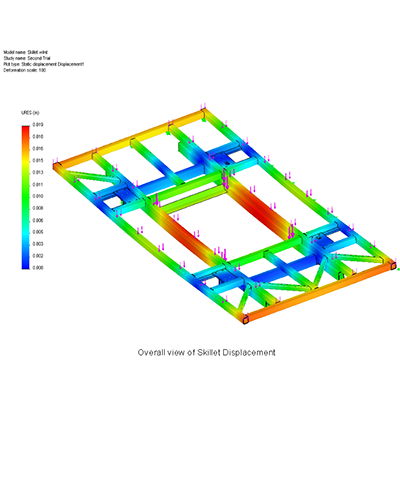 Wide Skillets based on the operations to be performed and space constraints. Most newer systems are wide skillets. Fixed Height vs. 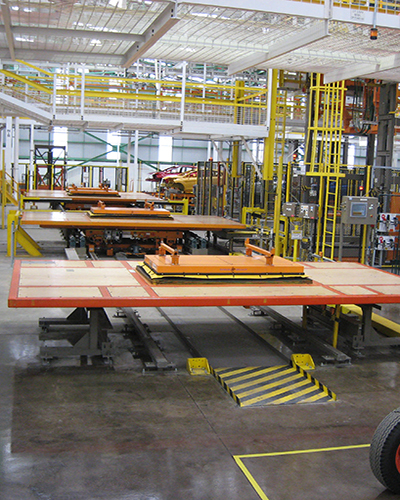 Lift Tables: This element is again based on operations to be performed. 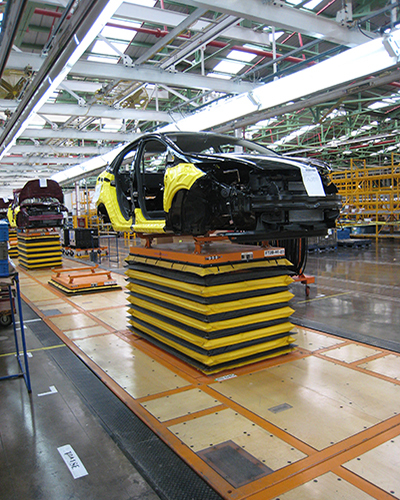 Lift Tables provide the most flexibility but are more expensive. 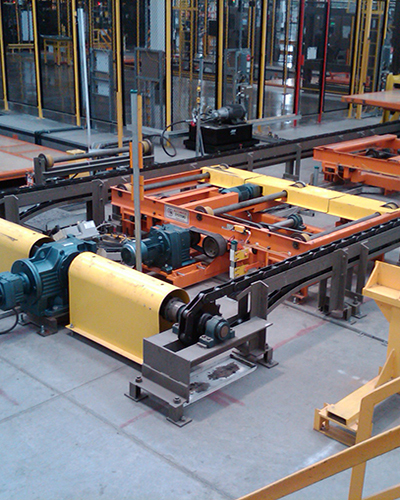 Rail vs. Roller is a client preference – sometimes there are space constraints in the pits, etc. We can provide either. 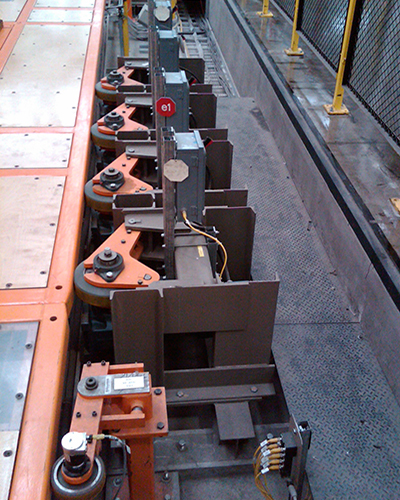 Skillet Conveyors are ideally suited for General Assembly operations where universal access to the product is desired. Because the product is supported from underneath, there are no carrier “arms” to interfere with assembly operations. This is especially important for inserting entire sub-assembled modules such as cockpits and seats into bodies. Automatic Systems, Inc. can design the skillets to carry multiple products based on pick up points on fixtures or lift tables. We design, build and install units in a modular construction application with requires relatively few main components.